Your Kate Middleton Knock-off Ring, on Sale Now! 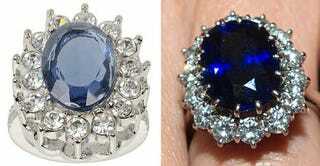 You can't have the real thing, but you can settle for next-best: Kenneth Jay Lane's "Princess Simulated Sapphire Ring," now on sale at QVC for just $39.54 plus shipping. It's "blue blood brilliance"! Get one for each finger.